Once, I had a roommate from hell. She was so messy we couldn’t use the countertops, and she would lose her temper at unpredictable moments for reasons like, “you were laughing.” Then she’d complain about her life for hours, completely unaware that she’d alienated me by being so horrible, and that as a result I simply did not care about her, or her problems. JEALOUSY is that roommate from hell. You hope she’s not going to come home, and mostly your schedules don’t overlap…. but when that roommate IS around, all she tries to do is tell you what to do. Or, she just acts so horribly, leaving dirty dishes everywhere and eating your food, that you can only think of her. I used to be controlled by my jealousy. I used to burn relationships to the ground because of it. Now, soooooooo many years later, I’ve learned how to work with, not against, my jealousy — which has helped me build more honest relationships with everyone in my life. If you can do one thing, and one thing only, this would be my greatest suggestion in those moments when you can’t think of anything but how you’d like to take someone out. So the next time you run across an old photo of your new love interest with his ex-girlfriend on Facebook, and she happens to be like a 14,523 x more accomplished, put-together, and beautiful version of you* ? Name your jealousy when it arises. Call it like it is when you feel it! THEN OWN IT. I used to think every time I felt jealous, it was MY fault and I was so weak for feeling that way. I was ashamed. In moments when I wasn’t feeling ashamed, I was so consumed by my jealousy that I couldn’t even see how it was driving me to micromanage my relationships and pick random fights. Now, I know it is not always my fault. Sometimes, there is no good reason for my jealousy–in those times, my jealousy reflects my own insecurity that I must deal with on my own. Other times, I meet bad eggs who intentionally provoke my jealous reactions, because it’s a fun power trip for them. That’s just bad form. How do you know the difference between the overreacting-type of jealousy, and the you-just-know-bad-people type of jealousy? You can’t know. At least, you can’t…… until you can first name your jealousy. Naming your jealousy includes identifying WHAT jealousy feels like to you. Does it make your heart beat faster? Your legs shake? Your stomach feel nauseous? Name it. Call it jealousy. Over time, you will learn WHEN (approximately) and WHY your jealousy strikes. It’s okay to say, “I feel jealous,” because your jealousy is separate from you. It is not your entire identity. It does not own you. Naming it will help you to remember this. Your jealousy is that roommate from hell that comes home sometimes. Here’s an actual, true story about naming jealousy. When we started dating, one of my most beloved ex’s claimed he “never felt jealous.” As time went on, he realized that what he called “anxiety” was actually “jealousy.” For example, the time I hung out with an acquaintance who then asked me, “Wanna get it on sometime?” while I was dating my ex? Boom. Realization: jealousy. When we were able to talk openly about our jealousy, we realized it was more important for us to work through it, than manipulate each other with it. *** This helped us build trust. Over time, my ex’s jealousy subsided when he saw that I was fully committed to our relationship: for example, without him asking, I never saw that acquaintance again. And vice versa: my jealousy around his past subsided; his last gesture was de-friending all of his former flames from his Facebook account. If you’re working through jealousy with a partner, a true and loving partner will care when you say, “I feel jealous.” But you have to be brave enough to say it. It’s vulnerability. It’s also petty (sometimes–but let go of the self-judgments; we’re not here for that right now). No matter what, you do not have to let jealousy “own” you. What are you doing when you name your jealousy? You are essentially taking a step backwards from it and looking at it. Over time, you’ll see it, and talk to it. You’ll figure out how it feels in your body, and when it comes around to visit. The point is not to ignore it, banish it forever, or beat yourself up when it appears. The point is to know when it’s there. Eventually, you will figure out how to make your schedules work out so you don’t have to live with jealousy, your roommate from hell, on a regular basis. You’ll recognize it, so therefore it’ll be easier to see when it comes around. Maybe every now and then jealousy will stop in for a visit. But when it does, you’ll be able to walk the other way. At least…. this has worked for me. What’s worked for y’all? * Uh, not like that’s ever happened to me. ** I hope these never happen to you. Hella tacky x 12,515. 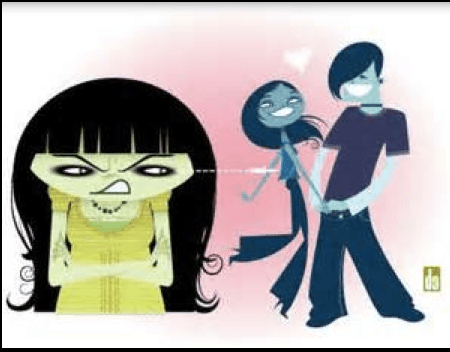 *** Jealousy manipulation happens when you make a totally reasonable request that your partner disregards, either by “forgetting,” saying “no,” or making a dumb excuse up. Examples of my totally reasonable requests: Please… don’t talk about loving emotions towards your ex; don’t sit on your ex’s laps; don’t kiss people on the lips that are not me. I am understanding with mistakes, but I am very, very clear about my boundaries when they are crossed. And when they are crossed too often, I walk away. But that’s for another blog post!